One day Bhai Sahib was arrested by Vairoval Police in the Amritsar area. For many days Bhai Sahib was kept hanging upside down in the police station. Foot-long metal rods were heated up and hammered into his legs, from the heels upward. A pin was put through his private parts and an electricity connection was attached to it so that he could be shocked. Hot metal rods were also passed through his chest. But the Guru’s Singh took the tortures calmly. All the torturers heard was “Vahiguru”. No cries of pain, no screams. Bhai Sahib called out, “Sentry! Bhai Sahib Ji, what time is it?” He felt around himself with his hands to find the guard. The Sentry looked at Bhai Sahib’s face and felt frightened. “Oh, it must be time for Sodar then. Sodar tera kayhaa…” Bhai Anokh Singh began to recite Rehraas Sahib lying on the ground. 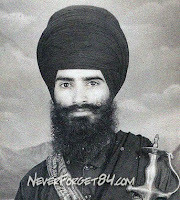 Even though his body was shattered, Bhai Sahib recited the paath in a sweet voice. The Sentry too felt the vairaag. The Jaikara Bhai Sahib sounded echoed throughout the police station. The Sentry ran to the station-head and surrendered his rifle and tabled his resignation. “I can’t do this job that forces people to kill saints…I can’t…” He kept repeating himself. And then another atrocity was committed. Bhai Sahib’s tongue was cut off using a metal cutting saw. Streams of blood flowed from Bhai Sahib’s mouth but the faithful Singh raised his hands in Ardaas and thanked Vahiguru. In the end, the police became tired of all this and shot Bhai Sahib in the station. When the shot was fired, a motor cycle was started so that the gun could not be heard. Over night, Bhai Sahib’s body was thrown into the river Beas.